This evening I was finally got a chance to prepare my halibut for dinner (it was still frozen solid last night so I made Pizza Style Skillet Chicken instead). 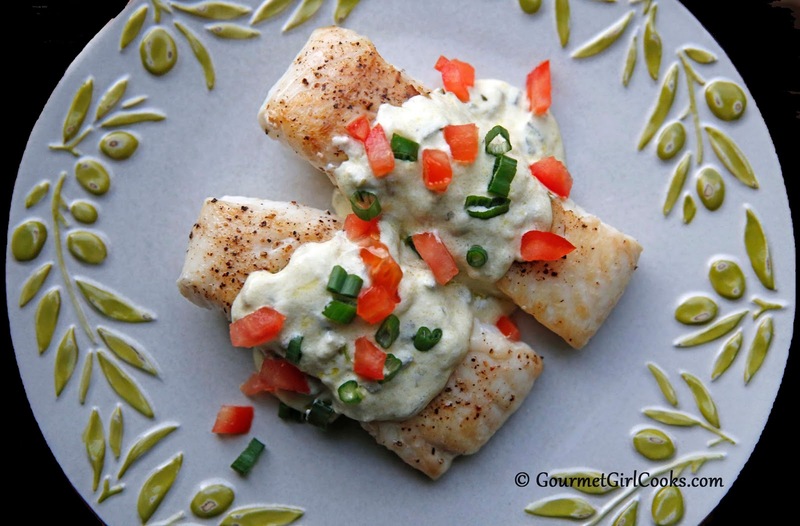 Wild Pacific halibut is one of my favorite kinds of fish (besides wild Alaskan Copper River Salmon). It's a mild tasting solid piece of fish and is delicious simply pan seared in butter or olive oil with a bit of salt and pepper. It also takes well to any type of sauce. I wanted to change it up a bit and make a new sauce this evening. As I poked around my fridge I came across a Poblano pepper...and my mind instantly began thinking "Poblano Cream Sauce". If you've never had Poblano peppers before, they have a tiny bit of heat but are pretty mild overall with a nice flavor. I actually prefer them to regular green bell peppers. The sauce turned out absolutely delicious. 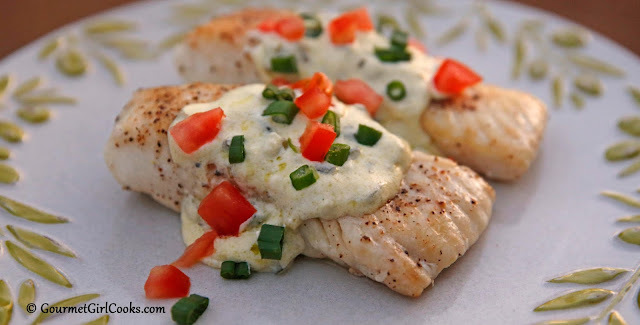 It added a delicate Mexican-ish flavor without overpowering the halibut which is important because you don't want to compete with its delicate flavor. 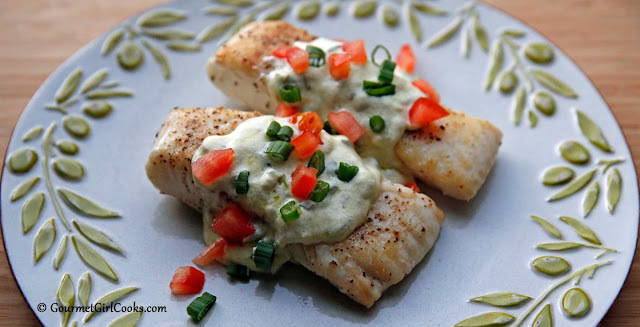 The halibut itself only takes 6 to 7 minutes total to pan sear and the sauce is easy to make and takes about 15 minutes, most of which is the time that it takes to saute the Poblano peppers until tender. This sauce would go excellent over chicken as well. I snapped a few photos below and included the easy peasy recipe. Enjoy! Heat olive oil in a 10-inch nonstick skillet over medium-high heat. Season halibut fillets with salt and pepper, to taste. Cook approximately 3 minutes per side until lightly browned. Transfer to a plate and cover with foil to keep warm. While halibut is cooking, add butter to an 8-inch nonstick skillet over medium heat. Saute Poblano peppers and onion until tender, about 8 to 10 minutes. Reduce heat to low and add the cream cheese to skillet, stirring with a spoon or rubber spatula until it begins to melt. Add cream or milk, 1/4 cup at a time, whisking and blending into the cream cheese mixture. Season with salt and cook over low-medium heat just until sauce begins to bubble, stirring frequently. Stir in sour cream and lime juice; taste for seasoning. Serve halibut topped with Poblano Cream Sauce; top with diced tomatoes, if desired. At one point today our temp was 69, so I think we were almost equal with you. The wind was so strong this afternoon that it just about knocked me over and it's even stronger now ... howling away! It's still 52 degrees at 10:30 p.m. in the middle of February in Mich. I'm beginning to wonder what summer will bring this year! Wow, what a drastic change in your weather! From the 20s you wrote about in the last couple of days to near 70 today! And your 52 degrees at night -- my temp is 43 now, almost 10 degrees colder than yours! How bizarre is this weather recently? We have had unbelievable rainfall and I believe more is expected next week. I just hope our mosquito population doesn't explode this spring/summer with almost no real hard freeze for any length of time and all the rain we've gotten. Especially with the Zika virus out there now. Looks amazing! Do you think this crust could be made a day ahead and refrigerated? Thank you for all you do for us! I'm not sure if you meant to ask if the "sauce" could be made ahead of time OR if possibly your comment was referring to my "Cheese Head Pizza Crust" recipe? Let me know if it's the Poblano Sauce you are referring to. If so, it probably can be made ahead of time and then heated on low.